OMG Posters! » Archive Mondo Star Wars Series - Rhys Cooper's "Salacious B. Crumb" Art Print (Onsale Info) - OMG Posters! The newest print in The Alamo Drafthouse Star Wars poster series has been revealed and it’s pretty intense. 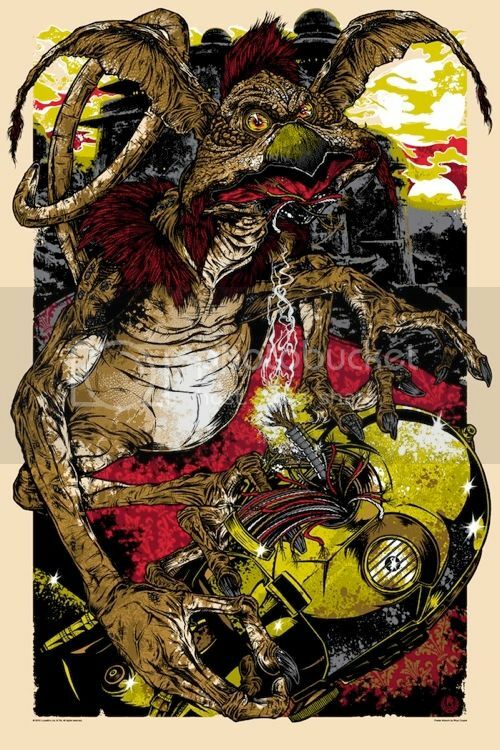 “Salacious B. Crumb” is a 24″ x 36″ screenprint, has an edition of 325, and is $50. It goes up today (Thursday, September 30th) at a random time. Vist Mondotees.com. Yeah, this is one of the best ones yet. This is my absolute favorite so far. I agree that this is by far my favorite one of the series, here’s to spending the rest of the day beside my twitter account. I really dig it but will have to pass. Don’t have the funds. Ha, Ha, that’s pretty awesome.. Too bad i don’t have the cash. Great detail but not something I’d want to look at all the time. Good luck to those picking it up though! Can’t wait to see this one up close. Im with Dylansdad here, still got the perfect record in tact. Get to pack up my stuff in 20 minutes from work for a 1/2 day on the my birthday and go home to have a beer at 1230 with my lunch. Thanks everyone, My girlfriend got me a plane ticket to Pitt to see my old roommate from college and a pair of tickets to Wings – Pens. Im a die hard wings fan, he is a pens fan. Should be awesome. Was fortunate enough to be at the Alamo when I got an email saying that they would have copies down there. Picked one up real fast like. Thing looks amazing up close and personal.